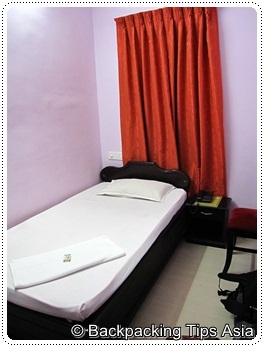 Looking for a room in Trivandrum? But I'll be quite frank: Travelers tend to avoid spending a night in the city unless they have to. Backpackers tend to travel further to Kovalam or other places in Kerala. Trivandrum is only a pit-stop on the way. To avoid any hassle at arrival, remember to reconfirm the booking prior to departure. If I would come back to Trivandrum, I would stay at Princess Inn again (but in the "new" building). I stayed there twice, in two different buildings. The first room was in the older building (triple room), which was clean, neat and quiet. The attached bathroom was clean and came with Western toilets. The bathroom is a little run-down, and even though there was supposed to be hot water, there wasn't. I was on a field trip and on a budget - which meant that I didn't have high expectations. The triple room in the old building was pretty much, just OK. The other room was located in the newest building. It was a single room with attached bathroom. You could see that this room was newer since it was very clean and tidy, and yes, I got hot showers and a comfortable bed! Clean, fresh towels and soap are included in the room. Both of the rooms came with TV. Ordering breakfast or lunch at Princess Inn is possible. All you got to do is pick up the phone in your room, and call the reception. The breakfast is simple and Western (toast, jam and scrambled eggs). Sonya, one of the care takers was very nice and helpful. At the reception, they can arrange transportation to various places in Trivandrum. When we wanted a local SIM-card for the mobile phone, she helped us arranging one. Below you'll find other sleeping options in the city. All of them are rated highly at Tripadvisor. Room prices are picked up from their respective web sites. How is the shopping in Trivandrum?